This area of the city was largely developed between the 1950’s and the 1980’s. Sidewalks were seen as an unnecessary expense, or even more cynically, as a way of inviting less-motorized outsiders into the neighborhoods. Even if the city built sidewalks in all of these underserved neighborhoods, there still would be major connectivity issues. This Urban Indy post from a few years ago highlights the largest sidewalk misses in Indianapolis. Some have been filled in, but many have not. Building a decent transit network in these areas is also a tough haul. In a city with some challenges to tackle, serving this area with sidewalks and transit might prove to be one of the more perplexing to solve. This also means that my neighbors in Meridian-Kessler with the “fix the sidewalks on Central Avenue” signs (aka some of the best sidewalks in the city) might just have to wait a loooong time. At least we have sidewalks in our area, folks. Are they really “underserved” neighborhoods? What do the street layouts and lot layouts look like? A lot of those early suburban-style neighborhoods function just fine without sidewalks…as long as there are sidewalks on the arterials that connect to the destinations. Here’s the map with the street network turned on. Arterials are also often left without sidewalks in these areas. …rather than the (informal? 0fficial?) “squeaky wheel” approach. Data also go a long way when countering the squeaky wheels. I know for a fact that Health by Design has looked into getting funding for sidewalks for many suburban-ish schools. I helped make maps for them. I don’t have an accident layer, but I do have trails and schools. I could add those, maybe tomorrow. Maybe add libraries too? Jackie Nytes at IMCPL knows how to make a smart pitch for public spending…we’ve had conversations about how libraries should be well-connected civic hubs. She could take this and run with it. Tyson, that is interesting about IMCPL because all of their plans call for nothing but suburban style libraries. I always wish they would build a nice public library in Broad Ripple to replace the Glendale Mall library. I think it’s harder to justify funding for grand (?) civic institutions when there is unmet need. Granted, good design (that can be constructed within the budget) only costs a fraction more. My comment had more to do with leveraging the libraries to justify connectivity improvements…much like the Safe Routes to School program does with schools. Jackie certainly understands those issues well and would be open to going the extra mile to hasten creative solutions. Sidewalks are what attracted my parents into buying a home north of 16th and Emerson. The homes south of 16th were a little nicer, but as a child, I constantly played on our sidewalks, so they did make a good choice! I always wondered about the lack of sidewalks too. Another aside…the City just redid the street/sidewalks on my (short, non-arterial) street in M-K. There is no equity when it comes to which street/sidewalk needs get addressed. My old street in Mapleton-Fall Creek was (and remains…) in way worse shape. That’s really no surprise. The (property) tax dollars get returned to the areas that pay the most taxes. The squeakiest wheels get the grease, in other words. I would prefer a process to at least listen to other places in the city with less of a voice. They might pay less in property taxes, but they are still citizens, and have just as much of a need for sidewalk connectivity. I don’t think so. In MFC, I *was* a very squeaky wheel…along with my neighbors, my neighborhood association, MFCDC, etc. The one significant piece of infrastructure spending I was able to bring to the neighborhood happened because I asked Jackie Nytes (CCC) to make a phone call to David Sherman (DPW) to support our Double 8 Rain Garden project (funded by Indianapolis Water and KIB.) I’m pretty sure infrastructure money goes where influential people ask for it to go, not where squeaky people ask for it to go. That’s basically what I meant here….influence, rather than squeakiness. Tyson, is this the guide for the 50-50 Infrastructure Grants Program? Our Meridian-Kessler neighbors on Central want their sidewalks fixed. Meanwhile, over in Zone 6, we get to navigate around utility poles in the middle of the sidewalk on 52nd and with incomplete/missing sidewalks on 54th. Yes, there are missing sidewalks on 54th that require pedestrians from MK to cross back and forth several times in order to get to the interesting destinations near and across the Monon. Good topic. I noticed the donut effect too, and, frankly, it helped tamper my annoyance with Indy’s lack of sidewalks. As you noted, “the city went through a ~2 decade period of purposely not building new sidewalks.” And this wasn’t unique to Indy. Virtually every city in the country did this same think for development that took place in the 60s, 70, and much of the 80s. Even seemingly hyper-urban places have this same condition. Like New York City. Parts of Staten Island that developed during that same period have no sidewalks. The difference is that, in most cities relatively little new development took place in that time period (most East Coast cities were already built out so the development took place in the suburbs). And higher density cities have enough of a tax base and good density that they’ve been able to correct these mistakes more effectively. But other low density cities that boomed during that time—Kansas City, Oklahoma City, Columbus–have a similar dearth of sidewalks, even on collector and arterial roads. This map particularly shows the lack of sidewalks on the south side, where I’m from. This side of town remained very undeveeloped even up to 1970 with Unigov, and virtually all development that took place outside the city limits took place without sidewalks. Though less built out in Franklin and Decatur Townships, Perry is pretty heavily populated and still has few sidewalks. Even some of the ones indicated, like Madison Avenue, are patchy at best: it was built in the mid 90s, and the DPW made it intermittent, not bothering to install sidewalks on both sides of the street if grade changes required a higher-than-usual cost. Very lazy work done back then. Makes the half-sidewalk along S. Emerson Avenue seem like a masterpiece in comparison. I’ve always been conflicted about the equity issue you mention here. AT first glance, it seems right that we advocate for equity in infrastructure – sidewalks, bus service, libraries, etc. But does it really make sense to deliver sidewalks to all 400 square miles of Indianapolis? Why not focus on the urban, pre-1950s core – an area that has either A. the density or B. the property tax valuation to support these type of investments? We know that type of development pattern is better for our social, physical, and fiscal health, so why not invest in it and pour money into programs that bring people in, rather than spending money in ways that encourages people to move ever farther outward? Just a thought – would love to have some dialogue on the idea. I think about this quite a bit too. In Fletcher Place, the average number of feet of sidewalk per property is probably around 40-50ft. At my sister’s house in Perry Township, it probably more like 90-100ft. Add in the that property values are much lower there, a sidewalk there “costs” about 4-6 times more per property. It just isn’t sustainable. Exactly right. We know that we will never have the money to create a high-quality environment/provide services across 400 square miles, so why even pretend like we’re going to try? It would be great to see some kind of right-sizing within the city, and incentives for people to build/move closer in. Add to this the fact that these low-density residential streets are pretty quiet…quiet enough to safely walk a dog or a stroller along them. As Tyson pointed out in the very first comment. 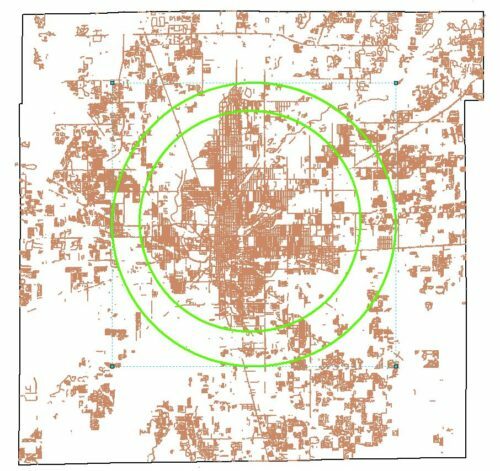 I lived in that circle, near 56th/Kessler/Cooper, for 25 years. There were no sidewalks anywhere. It didn’t matter, for two reasons: (1) anything you might want to walk to was too far away, a matter of miles, and (2) if you were just going for a stroll the closed nature of the cul-de-sac neighborhoods meant you could safely walk in the street. Exactly. I think Carmel (Hamilton County?) has done a lot of things right in this regard. Though it seems many new cul-de-sac type housing developments have curbs/sidewalks (maybe as more of a roadway stormwater management tool? )…there are multi-use trails/paths along most arterials. Indy would do well to replicate those “arterial trails” in strategic areas in that donut as a basic multimodal connectivity measure. As an aside, just saw that some IN legislators are questioning whether trails count as “transportation” re: Major Moves fund increases a la IN Toll Road. Laughable. Still lots of opportunity for education. They’ve done a good job with the building out, but I wonder what Carmel will look like when the “growth stage” is over. They’ll be left with super low-density development and a ton of infrastructure to maintain. Basically, they’ve staked everything on the hope that Carmel will remain a high-income area with correspondingly high property values. Maybe it will, but maybe not. There is one such trail along 71st St. from the Binford shopping area east to Shadeland Ave. People living on the low-density residential streets have a safe way to ride a bicycle to places where they can do daily tasks. Marion County’s suburban districts probably need more of that. Perry Township near Perry Meridian HS has a new sidewalk that could just as easily been a wider multi-use trail connecting subdivisions to retail at Stop 11/Meridian School Road and South Meridian/SR135. It could also connect to Perry Park and farther east to US31. I actually grew up in a closed loop neighborhood without sidewalks. I did walk and bike in the streets. I’d say it’s probably more of an issue in neighborhoods that are closer to the urban core with more of a grid pattern. The place where my daughter goes to school at 51st and Evanston is a good example. Very few sidewalks in what should be a walkable area. I support more multi-use trails to connect the cul-de-sac neighborhoods to the main intersections. I think Indy’s oft-cited stats as to weak walkability–such as low density and walkscore.com score (about 30) is kind of misleading, because those figures take into account the entire Unigov area. Most other similar size cities have a much smaller core city that provide the score/data, while often having similar unwalkable suburban sprawl around it. I’ve often wondered if there is a process to appeal to walkscore to only include the non-sprawl part of the city. If you essentially just used the part inside the donut on your map, the perception & walkscore (and therefore eventually the reality) would be of a reasonably walkable & bikeable city and attract people looking for that. I’m not sure on what jurisdictional/legal basis a narrower definition could be defined, but I’m sure there is a way. It would certainly be fairer than having all of Unigov compete with dramatically smaller city boundaries in walkability stats. For example, Portland OR gets a score of 65 because the “city” only consists of 145 sq miles, so that’s all walkscore counts. Indianpolis has 368 square miles. If our density, walkscore, etc. metrics were only done on the core 145 sq miles, how would we compare to Portland? I suspect pretty favorably. I suspect you are correct, Russell, and I think your point about perception becoming reality is spot on. That said, perception only gets us so far – at the end of the day, Indy still has very real long-term maintenance liabilities (to say nothing of building new) that Portland doesn’t have, and that hold us back from becoming a more walkable, high-quality place. UniGov bought Indy a few decades, but I believe it will go down as one of the city’s worst political mistakes (maybe tied with property tax caps). Use the defined “Compact Context Area” from the City-County zoning ordinance? That’s a legally-defined and mapped area. I think the best solution to many areas in these donut regions is to provide some type of trail or collector pathway that services the entire block/neighborhood. I look at the Ravenswood/north-of-broad-ripple-park/east-of-broad-ripple-park areas and everyday I see people walking in the street/ditch to get to work/bus routes/parks/ and shops on keystone and college. If there were even just 2 or 3 main paths running through the area connecting the area to Keystone/College/BR park, the area would be greatly benefited and safer.